Robbins Architecture company has created the clever outdoors house, which has no means for using specific rooms. This way the house connects the outdoors with indoors, bringing the natural green landscape into the Glencoe Residence by means of glass, wood and imagination. What is the most important part of the house? Well, the space, as some might say. But what if the space is not confined with walls, so there is practically no such notion as a “room”? 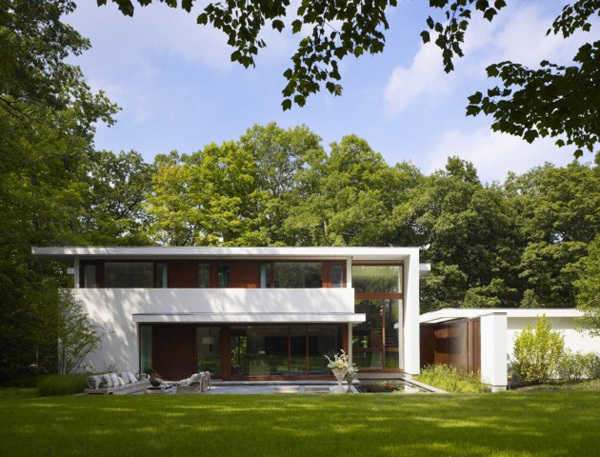 That is exactly what Robbins Architecture team has done with the Illinois-based Glencoe residence. It has built a house that expands itself into the outdoors. Once you enter the house, you see that the exterior goes on inside. There is a staircase’s 35 foot high glazing, which offers the stunning view on the green landscape and a reflective swimming pool with a lounge area. The living space of the indoors also has a wall-sized glass to open the view to the outdoors. The kitchen-family space is located near the living space and extends itself to the sunken terrace. To highlight the meaning of landscape setting, the architects has chosen the wood language to create the conversation between the indoors and outdoors. The detailed elegance of woodwork on the exterior connects the green lush scenery with the house, promoting the woodworks inside the house. By the way, Robbins Architecture has used principles of yacht building to create these panels. The interior of the house is surprisingly light and very comfortable. It is simple, versatile and very stylish with bits of contemporary designer furniture pieces, along with wood paneling that echo the exterior and the surrounding forest. Despite quite expansive, the house seems to be compact and fitting into the landscape as inside and outside of the house.